A test train pulls into the Western Avenue station at Monday morning's media event to promote safety along the Expo Line. Photos by Steve Hymon/Metro. 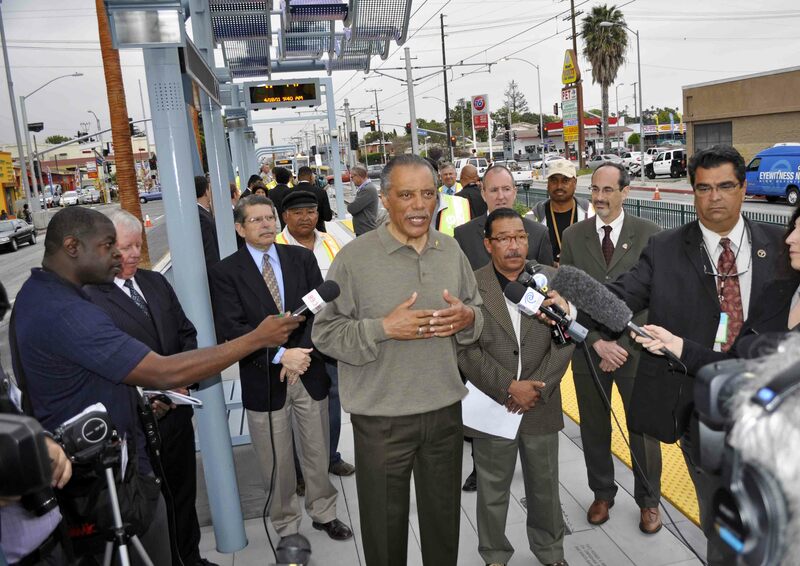 Several public officials gathered Monday morning at the Expo Line’s Western Avenue station to remind everyone that train testing will be increasing over the next several weeks and it’s important for motorists and pedestrians to aware the tracks are now active. From left, County Supervisor Zev Yaroslavsky, L.A. Councilman Bernard Parks, L.A. Councilman Herb Wesson, Culver City Vice Mayor Michael O'Leary and Culver City Councilman Scott Malsin. 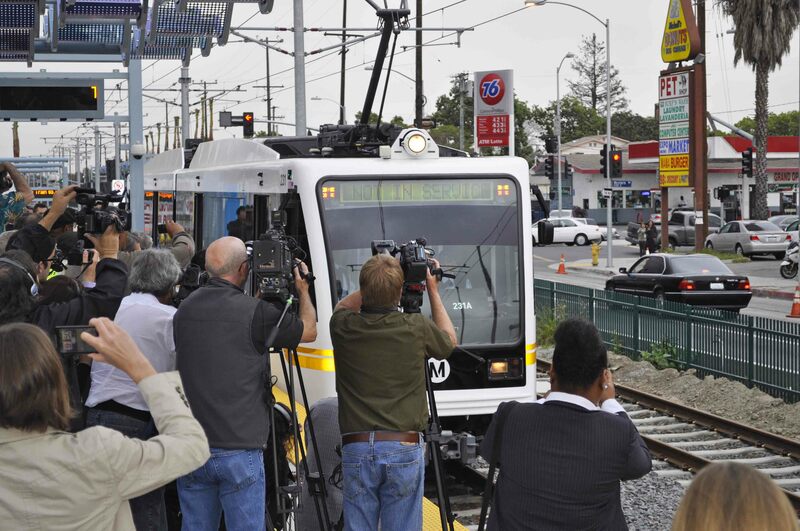 The short news conference — on the station platform — also gave officials a chance to express their delight and astonishment that after literally years of talk and construction, Expo Line trains are now actually running. L.A. Councilman Bernard Parks, whose 8th district also includes the Expo Line tracks, echoed those sentiments and reminded people that South Los Angeles remains one of the most transit dependent parts of the city. Expo Line officials have targeted mid-November to open the line to La Cienega Boulevard, followed by an opening to Culver City in the first quarter of 2012. The second phase of the project from Culver City to Santa Monica is scheduled to open in 2015. 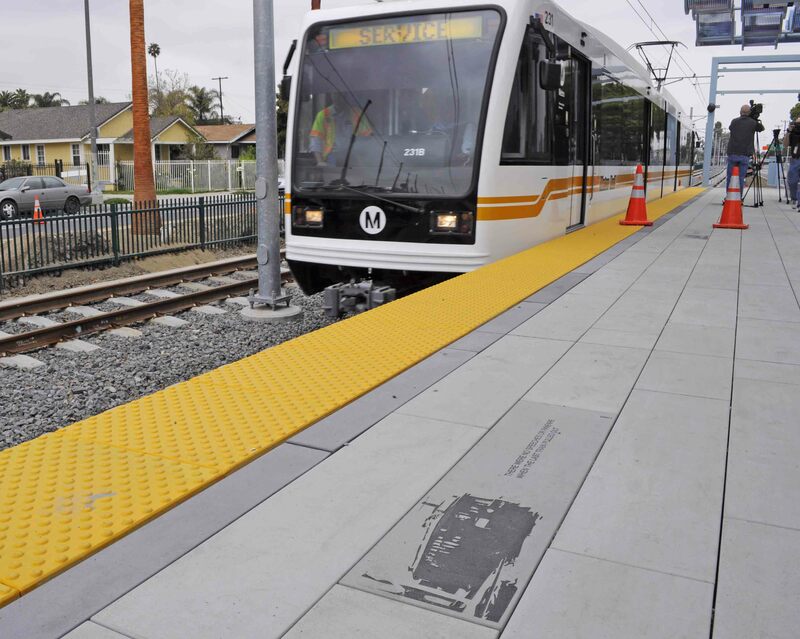 To read more about the Expo Line, visit the project’s website. Platform art reminds passengers of the days of the streetcar. Streetfilms asks: What is CicLAvia? This is great to see. The Pacific Electric tiles are a nice touch. So happy that it’s finally, actually operating. What an accomplishment! I’m glad light rail is finally returning to Exposition but imagine if the PE line was upgraded continuously over the last 60 years instead of being abandoned… LA would be a much different place transportation wise. It does take a while to build these facilities. Even the much loved and hated New York subway took almost 60 years to be built (first elevated lines built in the 1880’s – last major construction in 1940…since then only a few small additions and fill-in stations). Metrorail has been in progress for 25 years now. Imagine what it will look like in 35 more years…probably almost as extensive as the New York City subway was in 1940. What’s the reason that the Western Avenue (and some of the other stations) are “bisected” with the eastern/western platforms situated on opposite sides of the street crossing? Expo Line trains will be required to stop at red lights. Might as well put the station stops where red lights are if you are going to be stopping anyway. Excellent reason! So,how come that the same approach was NOT employed for any of the Blue and Gold Line stations?! Actually, at Western Avenue, the signals will be timed to let the train pass by and stop at the platforms which are on the far side of each direction. This is good operational practice. No need to have a shared platform, which would make trains in one direction always slower. Farmdale and Crenshaw stations will operate this way: the train will stop at the platform *before* crossing the intersection. These are called “near-side” platforms. However, Western and Vermont stations will have “far-side” platforms. This means trains will stop at their platforms *after* they cross the intersections. At these stations, trains will sometimes have to stop twice, unless signal prioritization changes the lights for the incoming trains. There might also be another reason: perhaps the constraints of WIDTH did not allow for a shared platform or for two opposing platforms for a given station? My mistake about Western and Vermont, but this presents an even less optimal solution. Without signal priority this stretch of Expo will be slow. Imagine stopping at the USC station, then stopping at the red light, then stopping at Western and Vermont. The perception of speed is sometimes just as important as actual speed, and this is definitely going to frustrate riders. I still don’t understand why signal preemption has not even been discussed, It would barley have any impact on cross traffic especially if the train schedule is synced with the lights. Again I will say that other cities have figured this out. Why cant we? Expo will NOT reach its full potential without this. Plain and simple. Plus even if it does impact traffic a little, doesn’t it seem like the whole philosophy behind these projects are backwards anyway? I mean, the criteria for signal priority or preemption is based on the wrong thing as it is all about how cross traffic is impacted without even considering how the train is positively impacted. This is literally their whole approach. Right now for example, there is a study about adding crossing gates to the east LA extension and all it talks about is cross traffic impacts and safety but not once does it mention the positive impacts on the very train service which it concerns!!! This all seems very odd and is also disappointing because it shows that there is still more concern about cars than transit. That’s a good point Connor. I honestly haven’t really thought about that much. Everyone really considers the impacts on traffic, but not the impacts to trains. It’s a weird thought that we’ll sacrifice one for the other, when really, traffic should be the one getting sacrificed, if anything.